The country’s most expensive property market continued its paradoxical growth trajectory from the last quarter to Jul-Sep 2015. Although the Mumbai realty market is replete with offers and easy payment schemes from developers, high unsold inventory has resulted in buyers adopting a wait-and-watch approach in anticipation of plummeting capital values. 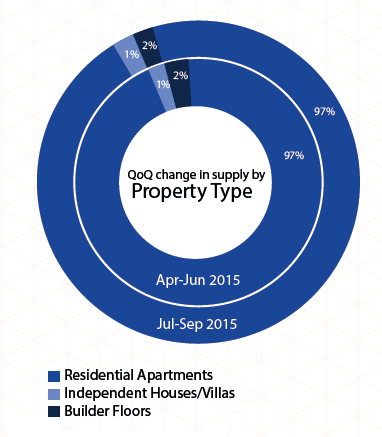 As per industry reports, the residential inventory pile-up in Mumbai soared to 77,460 by the first half of 2015. Despite this, property prices continued to rise. Only 3.35 per cent of the total piled-up inventory is ready for possession. Construction of only 1.10 per cent of unsold houses in Mumbai, 8.13 per cent in Navi Mumbai and 1.33 per cent in Thane, has been completed. The market witnessed maximum demand in the affordable and mid-income segments (Rs 25 lakh to Rs 60 lakh), while supply was for properties priced at Rs 1 crore and above. The 50 basis points repo rate cut by the RBI and the resulting expectation of decline in home loans rates infused some cheer amongst potential buyers. Foreign and domestic private equity (PE) investments in real estate are increasing, with Goldman Sachs, Warburg Pincus and Blackstone entering the market in partnership with Indian firms and investing Rs 6,000 crore. Recently, the Managing Director of the World Bank, Sri Mulyani Indrawati had expressed interest in funding the public transport infrastructure in the city, including metro projects. The Thane Municipal Corporation (TMC) is to formulate a city development plan by scrapping the 20-year-old existing plan. This will entail demarcation of roads, thus lending more clarity with regard to additional space for development within the city. In a bid to magnetise buyers to projects located in peripheral areas priced as low as Rs 6 lakh, developers are coming up with bizarre schemes. Some of these include, offers such as helicopter rides and jobs to female members of the family. 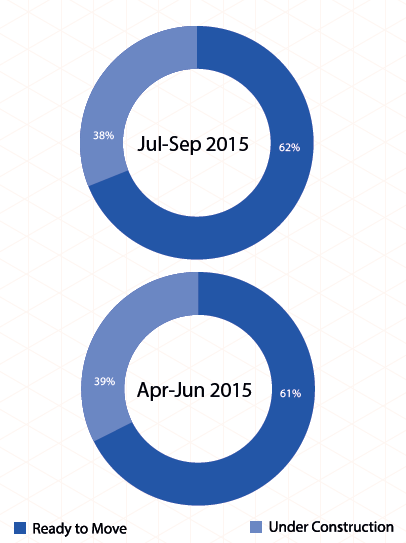 Property prices in the MMR, as a whole, grew minimally in Jul-Sep 2015. 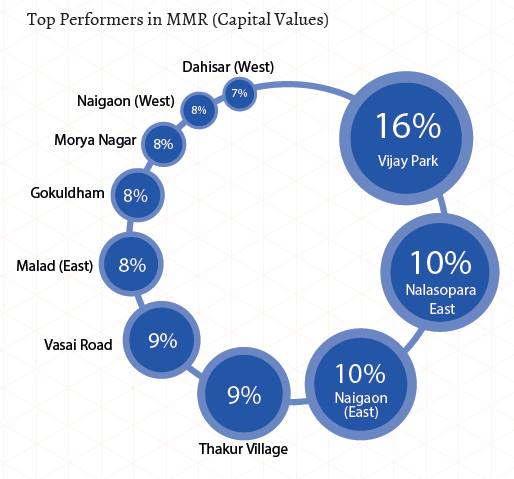 The top performer in this zone was Vijay Park in Mira Road which recorded a rise of 16 per cent, followed by Nalasopara East and Naigaon East, each of which witnessed a growth of 10 per cent. Capital values in and beyond Mira Road rose by two per cent this quarter, which was followed by South Mumbai and Central Suburbs, each registering insignificant growth. Meanwhile, the micro markets of Andheri-Dahisar, Harbour and south-west Mumbai remained stagnant. The government’s plan to build two new metro corridors – a 20 km line from D N Nagar to Dahisar and a 16.5 km line from Andheri East to Dahisar – with the help of World Bank funding has given a fillip to realty sentiments in the western suburbs. US-based Private Equity major Blackstone acquired the 247 Park project, situated in the IT corridor of Vikhroli West, for Rs 1,060 crore. The firm plans to create an IT Special Economic Zone (SEZ) with the Tata Group, Siemens, HCC, Piramal and Future Groups as its tenants. Commencement of work in Phase II of the monorail project has brought some cheer. The Mumbai Metropolitan Region Development Authority (MMRDA) confirmed completion of the 10.24 km stretch between Wadala in Mumbai Harbour and Jacob Circle in the South by the end of 2015. Almost half of the properties in the MMR are priced above Rs 2 crore, while affordable and mid-range properties cumulatively captured only four per cent of the market. Overall, the residential rental market of the MMR remained stagnant between Jan-Mar 2015 and Jul-Sep 2015, although certain pockets witnessed a robust spike in rental rates either due to their affluence or affordability quotient. 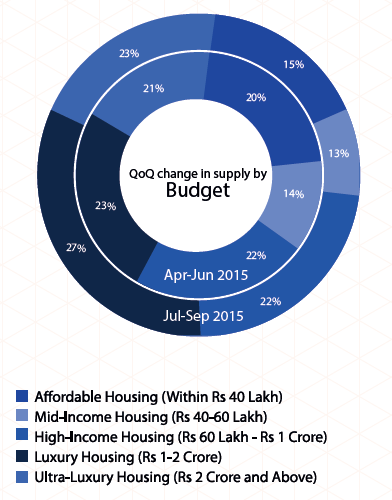 Mira Road and areas beyond saw rental values strengthening by two per cent in the first three quarters of 2015. The growth can be attributed to its comparatively low rental values, since a quality apartment by a reputed builder can be availed at Rs 18,000 – Rs 20,000 per month. 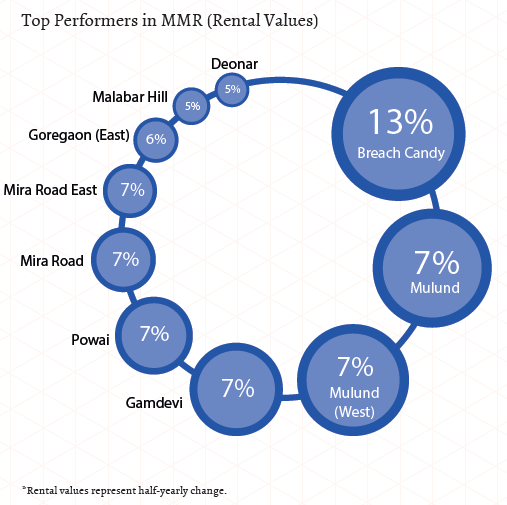 The highest rental gainer was South Mumbai’s Breach Candy, which witnessed values rising to the tune of 13 per cent during the span. The surge in price tag does not come as a surprise as this locality is home to the crème-de-la-crème of Mumbai’s society. Mulund West and Mulund followed Breach Candy with a spike of seven per cent each. The localities primarily house the business class with an annual income of Rs 20-40 lakh. The rental rates grew in anticipation of the Ghatkopar-Mulund metro corridor, and the availability of quality but affordable homes. Mumbai Harbour and the Central Suburbs witnessed minimal growth, while the Andheri-Dahisar belt remained stagnant. Rental values in South and South West Mumbai declined by one per cent and two per cent, respectively. In the otherwise grim real estate scenario, Navi Mumbai has a comparatively successful story to narrate. Accomplishing a two per cent growth in the realty charts of Jul-Sep 2015 vis-à-vis the preceding quarter, the zone has Navi Mumbai Airport Influence Notified Area (NAINA) at Ulwe to thank. After the possibility of Reliance’s Navi Mumbai SEZ getting scrapped, the government has extended validity of approvals to establish three zones in Dronagiri and Kalamboli. The expectation of upcoming SEZs which would result in more job opportunities, thus benefiting realty in the long run, has lent some positivity to the developer fraternity. Despite missing its deadline and seeing some hurdles with regard to project approvals, the first phase of the Navi Mumbai metro corridor has kept realty sentiments in Taloja and Kharghar buoyed. Almost 80 per cent of the first phase of the metro corridor, stretching from Taloja to CBD Belapur via Kharghar, is complete. The City and Industrial Development Corporation of Maharashtra (CIDCO) has launched an affordable housing project for the Economically Weaker Sections (EWS) and Low Income Groups (LIG) in Sector 36, Kharghar under the Swapnapurti scheme. This project is located at an easy distance from the proposed Taloja metro station and has positively impacted the residential market of Kharghar. Very recently, PM Modi laid the foundation stone of the fourth terminus at the Jawaharlal Nehru Port Trust (JNPT), also referred to as ‘India’s global economic gateway’. The development is touted to be a major growth stimulator for India’s export-import trade. 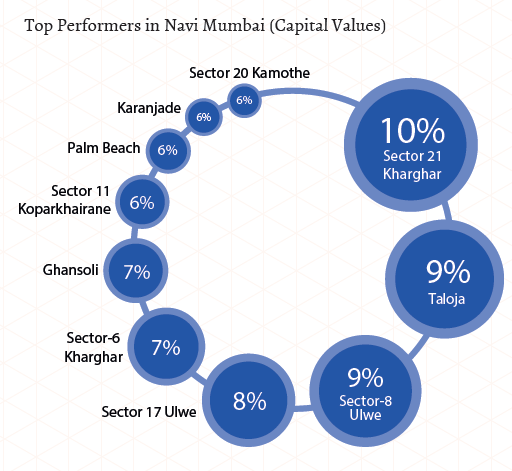 Navi Mumbai’s rental landscape made a snail-paced trajectory from January to September 2015, with only Kamothe, Ghansoli and Sanpada witnessing a growth by 10 per cent, five per cent and four per cent, respectively. Affordability is just one factor propelling Kamothe’s rental values. Being at an easy distance of 6 km from Kharghar, which will soon boast of its own metro station, proximity to the Navi Mumbai International Airport and the recent upgradation of the JNPT has given an edge to the locality. 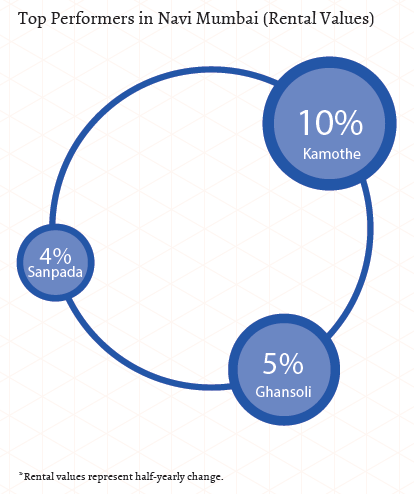 Ghansoli has seen some big ticket projects recently due to the paucity of land in Vashi and Koparkhairane. The buoyancy in Ghansoli’s rental market can be attributed to its competitive prices and the proposed Ghatkopar- Kopar Khairane Bridge via Ghansoli, which will be the third link connecting Mumbai with Navi Mumbai. There have also been talks of CIDCO transferring Ghansoli to the Navi Mumbai Municipal Corporation (NMMC). The transfer will benefit its residents, the majority of who are IT professionals, as it will lead to the completion of the long-pending sewerage lines and storm water drainage system. Sanpada’s capital and rental market grew at the same pace of four per cent in Jul-Sep 2015 due to the clearance of the Navi Mumbai International Airport, which is at an approximate distance of 14 km from this locality. Recently, the vehicular subway at Sanpada station, connecting the residential area with the Sion-Panvel highway, was revamped. Although the region, as a whole, witnessed a minimal growth in Jul-Sep 2015 as compared to previous quarter, the overall real estate mood of Thane is buoyant as a result of certain government measures and infrastructural developments. Property values in Khopoli surged by nine per cent during this time frame due to the upcoming affordable housing projects by the MCHI-CREDAI (Maharashtra Chamber of Housing Industry - Confederation of Real Estate Developers Associations of India) expo and other private developers. Proximity to Navi Mumbai Airport Influence Notified Area (NAINA) gave an edge to these projects. The TMC also proposed a bypass through the forest area, connecting the city to the International Airport. If accomplished, travel time between the junctions will be reduced by around 45 minutes. The collapse of a 20-year-old building in Kalwa has given impetus to the cluster development initiative in the city. Through this endeavour, over 2,500 old and dilapidated buildings would get repaired and refurbished. The lack of perceptible growth in Thane is being attributed to the sudden launch of six residential projects within a course of three months. Of these, two projects on Ghodbunder Road, are priced between Rs 7,500 and Rs 7,900 per sq ft. To this end, the market competition resulted in stagnancy in prices. However, the proposed Wadala-Ghatkopar-Thane- Kasarvadavli Metro IV proved to be a reason for the cheerful sentiment that Thane’s realty market is experiencing. 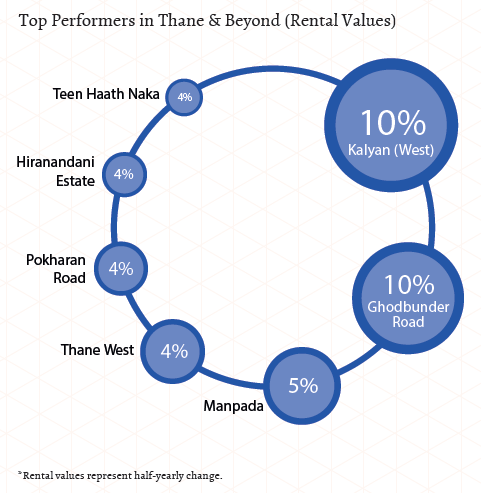 Clocking a rise of four per cent in Jul-Sep 2015, as compared to the Jan-Mar 2015, Thane’s rental market performed the best amongst all the zones in Mumbai. 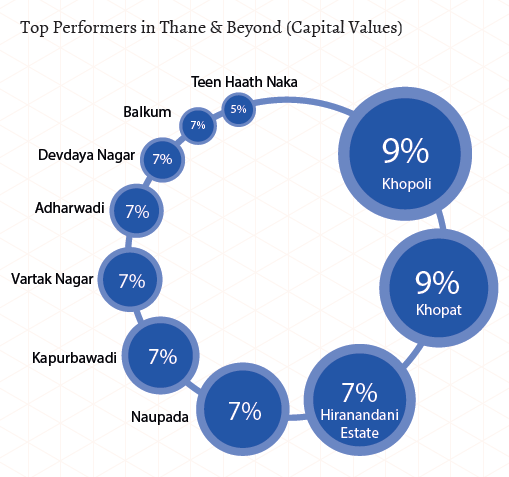 Ghodbunder Road and Kalyan West, which emerged as the top grossers in Thane and areas beyond, saw values rising by a whopping 10 per cent since March 2015. The localities were followed by Manpada, where rental rates jumped by five per cent in the first three quarters of the year. The proposed metro corridor, entry in the smart city race, additional Floor Space Index (FSI) of 0.3 as well as rise in office space absorption, have boded well for the city’s rental landscape. The rental market of Ghodbunder Road benefitted from the presence of large townships, sound civic and road infrastructure connecting the locality seamlessly with the rest of Mumbai. Hiranandani Estate saw rental prices escalating by four per cent. Presence of offices renders a positive impact on the rental market of the locality, as it attracts workforce who take up accommodation nearby. Recently, the locality witnessed Tata Consultancy Services (TCS) absorbing 2 million sq ft of office space, in the largest office deal in India. The relaunch of the state government’s ambitious rental housing scheme failed to attract private developers, despite the FSI being raised from 3 to between 3 and 4. Over 80 per cent of the properties launched in Mumbai during Jul-Sep 2015 carried a price tag of Rs 1 crore or more. This skewed real estate tendency in the country’s commercial capital led to a demand-supply mismatch. Most of the affordable projects were situated in the suburban locales with compromised connectivity. Not surprisingly, the skyscraper city of India witnessed a prodigious supply of residential apartments, saving less than five per cent of the market share for builder floors and independent houses and villas. 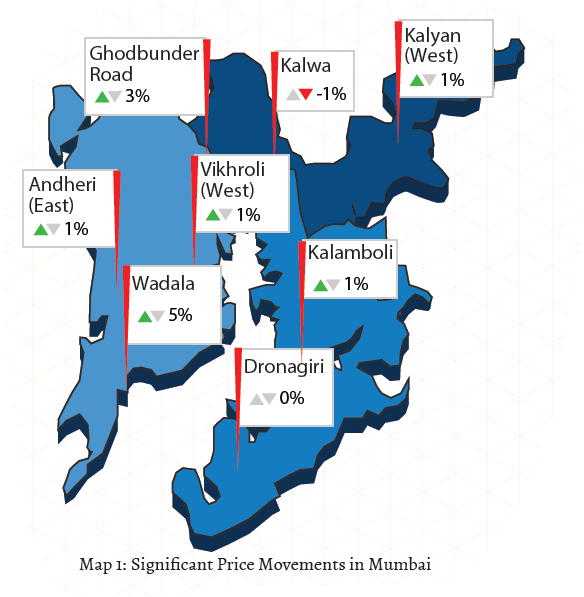 Despite being expensive, maximum supply of properties continued to be in the Mumbai Metropolitan Region (MMR), followed by Navi Mumbai and subsequently the Thane city. Although demand for apartments dominated other property types in all the zones, buyers in Thane and areas beyond it were comparatively more open to residing in villas and builder floors. Of the negligible supply of independent houses and villas in the city, most of this property type was concentrated in and around Andheri-Dahisar. More than a quarter of the total share of builder floors in Mumbai were seen mushrooming in the Thane zone. Within the MMR, Mira Road boasted of a robust supply of the same. While the share of properties falling in the luxury housing price range of Rs 1-2 crore in MMR has reduced from 90 per cent in the second quarter of 2015 to 83 per cent in the third, the percentage remains overwhelmingly high. Affordable housing, which includes properties under the bracket of Rs 40 lakh, hardly captured 15 per cent of the total market. More than a quarter of these low-priced units were available in Thane and the areas beyond. Demand for luxury-housing (Rs 1-2 crore) and ultra-luxury housing (Rs 2 crore and above) witnessed a cumulative jump from 44 per cent in Apr-Jun 2015 to 50 per cent in Jul-Sep 2015. As expected, the MMR featured almost two-third of the city’s share of luxury and ultra-luxury properties. However, tickets sizes ranging from Rs 2 crore onward made up a mere four per cent of the total market in both Navi Mumbai and Thane, thereby proving the popularity of these zones as affordable residential hubs. As per industry reports, of the 44,000 unsold apartments within the Brihanmumbai Municipal Corporation (BMC), more than 30,000 units were price above Rs 1 crore. Furthermore, the upcoming launches in the municipal limits of the city are within the same budget range. Since the last few years, developers have been cutting down on the unit sizes in order to reduce the overall price. The average size of a residential unit in Mumbai has fallen by 26.4 per cent in the last five years. For more cost-effective properties in Mumbai, the government needs to unlock land parcels and facilitate excellent connectivity. Reducing the cost and time taken to procure construction approvals would also go a long way in boosting affordability. Currently, it takes about 1-2 years to get all project approvals. The soaring capital values of the city ensure that small and medium-sized flats configured as 1BHK and 2BHK units remain in demand. The 2BHK configuration, being the most convenient for bulk of the population, sees maximum takers, thus capturing nearly half of the total market. In Navi Mumbai, the supply graph is heavily skewed towards 2BHK units (bagging nearly half the market), denoting a clear preference in terms of affordability. However, the MMR and Thane regions saw an almost equal distribution of 1BHK and 2BHK units. 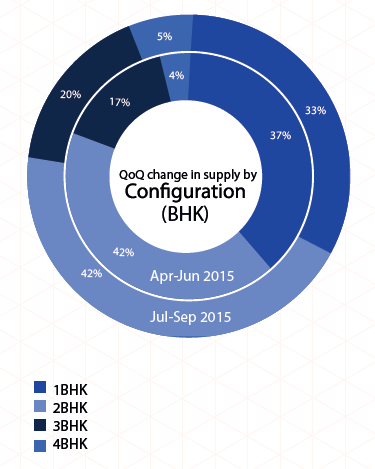 While supply of 2BHK units remained constant from the last quarter to Jul-Sep 2015, there was a slight drop in the percentage of properties configured as 1BHK. During the same time frame, supply of 3BHK and 4BHK units witnessed a slight uptrend. The rise in popularity of bigger configurations can be attributed to the presence of NRIs in Mumbai’s real estate market, who prefer residential properties priced up to Rs 3 crore. The devaluation of the Rupee, numerous discount schemes by developers and stable property prices provide the perfect atmosphere for NRIs to invest. Since real estate prices in Mumbai are not expected to appreciate any time soon, a lot of developers are targeting the high net-worth individuals (HNIs) and NRIs, for whom property is a safe investment. 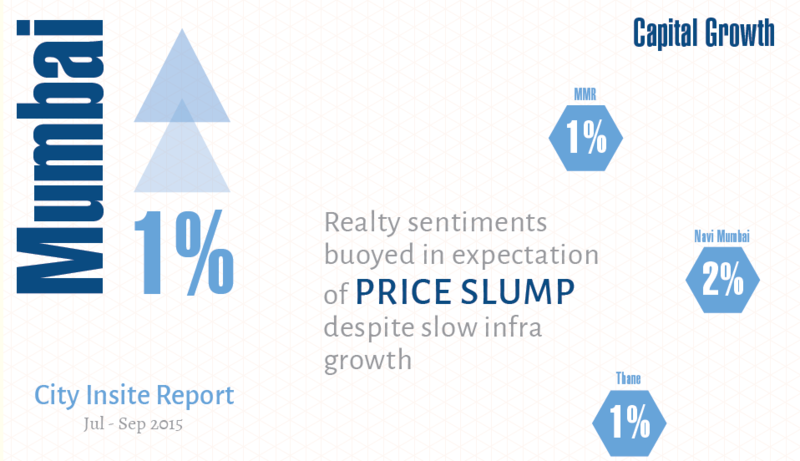 There has been a minimal dip in supply of under-construction properties in Mumbai in Jul-Sep 2015, indicating a lack of new launches. The trend is not unquie to Mumbai and is seen across all major cities with Delhi NCR topping the list. Among the few launches that took place in this quarter, most of them were in the South and south-west regions of the MMR and Thane. Most of these under-construction houses were in the high-income and luxury bracket, starting from Rs 60 lakh. However, the newly launched properties in Navi Mumbai were within the affordable budget range of Rs 40 lakh. These projects included apartments developed by CIDCO for Economically Weaker Sections (EWS) and Lower Income Groups (LIG). Most of the ready-to-move units in the MMR were located in the Andheri-Dahisar region, while the maximum number of under-construction properties were located in Khar in south-west Mumbai.